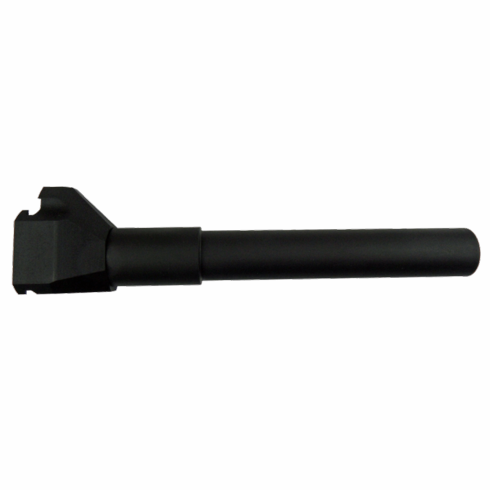 Enables the addition of an aftermarker arm brace or other pistol buffer tube accessories. Buffer tube is manufactured by KAK Industries specifically for fitment of an aftermarket arm brace. The threads on the adapter are standard sized to accept all AR15 buffer tubes/receiver extensions. The sole intended use of the CZ Scorpion EVO 3 S1 Pistol Arm Brace Adapter is to allow the attachment of an arm brace or other similar product to the pistol so that it may be fired in a manner consistent with all applicable laws. Users of the CZ Scorpion EVO 3 S1 Pistol Arm Brace Adapter bear the sole responsibility for ensuring their use of the product complies with all applicable local, state, and federal firearms laws. IF USING A BUFFER TUBE OTHER THAN THE SUPPLIED KAK INDUSTRIES TUBE THERE ARE TWO THREADED ALIGNMENT HOLES (10x32 THREAD) FOR TUBES THAT USE A NOTCH FOR INDEXING. A 3/16 OR 1/4 HALF DOG SOCKET SET SCREW WOULD BE USED FOR PROPER INDEXING.